Jibbio offers two services for small and midsize businesses, powered by a simple yet powerful toolset to yield growth and ROI. Other application service providers offer ideas that sound really nice but in practice, their (complex) tools may be costly, difficult to sustain, require IT staff, and may not be very effective. In turn, an expense rather than an investment. Our multifaceted 3-in-1 toolset will benefit any organization generating monthly ROI for our customers, which is what matters. Hence, we've earned a 92% customer retention rate since 2010. 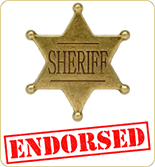 As a result, U.S. State Sheriffs’ Associations endorse Jibbio for its turnkey, community-centric services that offer sustainable fundraising capabilities. Jibbio cloud-based applications, data storage, and IT infrastructure have been securely hosted by Amazon® Web Services (AWS) since 2010, for your peace of mind.